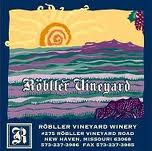 Our Missouri wine country can boast a variety of Missouri wineries and one of them being the Robller Vineyard. Located in New Haven, Missouri it is only 15 miles east of Hermann. Bob and Lois Mueller established the winery in 1988 and by 1990 they opened to the public. It’s a family business that started in the backyard of their home in Glendale, Mo. Eventually Bob retired from his job and went full time following his passion…wine making. They found the perfect location in New Haven, built the winery, set up the equipment and prepared for their first crush.They now produce over 5,000 gallons of wine annually from their 15 acre vineyard. In 1993 Robller Vineyard received Best of Show and the Governor’s Cup Award for their 1991 Norton Reserve. All of their wines are sold directly from the winery and a few select locations. Bob and Lois welcomes your whole family for a days visit, picnic basket and all. Their sales room not only has wine samples but snacks to. The next big event is the Chocolate Wine Trail on February 19-20, 2012 where wines are paired with chocolate. Our Hermann Missouri bed and breakfast still has some openings for that weekend. Make this your getaway for the month!